2018 has been called the “Year of the Open Door.” So the next obvious question is “Where is our open door?” Isn’t that the issue often times? It’s not that we don’t want to be in the right place, it’s just that we aren’t sure about the place where we belong or what we are supposed to do next. In 2018 He is positioning you. The good news is that He is positioning you to be in the right place at the right time doing the right thing. He says it to us, “A person plans his course, but the Lord directs his steps” (Proverbs 16:9). This is the deal about open doors. Not every door that is open is one you should walk through. And not every door that is shut, will remain shut. Sometimes it needs a good stiff kick to get it open. Sometimes we have to press in to see the door open. We can only do that when we know our purpose and path. We need to learn to listen to His leading rather than just watching for an open door. It’s about being positioned for your purpose. 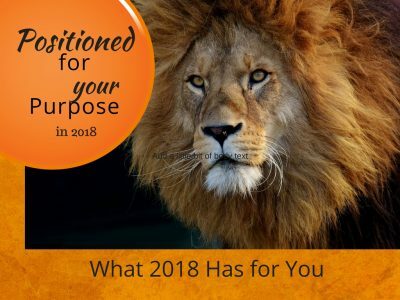 Your path for 2018 is for purpose. As I sat with the Lord recently I was praying (well maybe complaining) about 2017. It was supposed to be the year of breakthrough. 17 is the number of breakthrough and I fully expected to walk in it. But 2017 didn’t go as I had planned. How about you? It was a hard year in many respects and in one specific area, no matter what I did or how I prayed, I couldn’t seem to reach breakthrough. Then I heard Him speak to my heart. “Umm, well, no, I didn’t,” I thought rather hesitantly, because I knew that tone and knew He was about to show me what I had missed. So I sat with my pen in hand and began to think through the year. Had I seen breakthrough? And of course, I had. I began to write…and I couldn’t stop. Tears filled my eyes as page after page filled with the amazing things that had happened in 2017. Enormous breakthrough had happened! But because I was so focused on ONE area that had been a severe struggle, I took my eyes off all the blessings that had occurred. 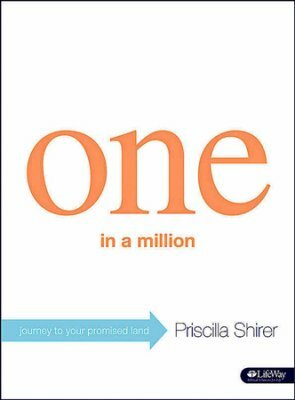 One by one I began to rejoice over each instance and area of breakthrough. I no longer was focused on what hadn’t happened, but was now looking at what had happened. And you know what? Later that very day, the one area that had been such a severe struggle all year long experienced breakthrough. Because praise positions us to reach purpose. It positioned us for blessing and it positions us for breakthrough. As we close out 2017 and enter 2018, it is important how we leave one and enter the other. I encourage you to sit with Him and write down every breakthrough you experienced in 2017. If it was a hard year, you may not think you experienced breakthrough. But if you were standing for it and believing for it, I guarantee you, there was breakthrough in some area. Let Him bring them to your remembrance. Let praise position and reposition you for your purpose in 2018. There are open doors waiting for you right now. As you walk through them, miracles await like packages with bows ready to be opened. You are on a path like stepping stones, taking you higher to that purpose. You will reach it. Just keep taking one step after another. Don’t stop. Sit with Him. Let Him outline your purpose, what He has for you this year. He said he would be your pillar of cloud to guide you by day and a pillar of fire by night. That means He is your Guide and Your Protector. Sometimes we become paralyzed with fear and discouragement. The paralytic that sat by the healing pool of Bethesda waited 38 long years. He kept waiting for someone else to put him in the water. But it wasn’t about someone else coming to help. He had been paralyzed into inactivity by a physical issue, but sometimes fear, depression, lack, etc. paralyzes us in the same way. Don’t let whatever happened in 2017 paralyze you from being positioned for your purpose in 2018. Get up! Get started. Walk into the Open Door that He has for you. If this has helped you or if you would like prayer, please leave me a comment below. Please feel free to forward this to someone you know that has been paralyzed by their pool this past year and unable to move forward in purpose. Also, Light and Remnant is a 501c3 non-profit ministry. If you would like to donate, please click the button at the top on the left to help this ministry continue. Happy New Year! 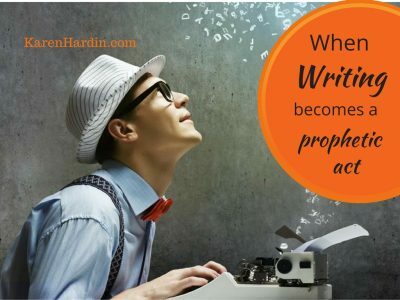 When you write something down for a book, an article or even your journal, it becomes a prophetic act that releases the seeds of the supernatural.